Taught by world-leading experts from our seven outstanding engineering departments, this four-year course will ensure you develop a broad knowledge and understanding of engineering, while developing skills in independent thinking and the professional skills necessary for a career in industry. In an increasingly complex and challenging world, knowledge and expertise beyond a single discipline is valuable for 21st-century engineers. During your first two years you'll study modules across all disciplines and look at engineering in an interdisciplinary context. 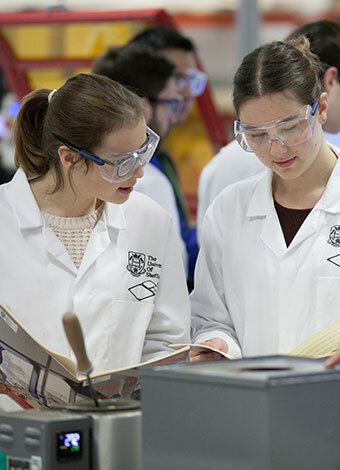 At the end of year two, you'll choose a specialism from one of the following 11 streams: Aerospace Engineering, Chemical Engineering, Civil Engineering, Electrical Engineering, Energy and Sustainability, General Engineering, Materials Science and Engineering, Mechanical Engineering, Medical Technologies, Software Engineering, Systems and Control Engineering. You'll have the opportunity to spend the third year working in an engineering company. You'll be able to put your academic studies into context and improve your skills and employability. Most students are paid a salary during the placement. You will pay reduced tuition fees for that year. While you are responsible for securing your placement, we have a dedicated Engineering Placement Team to help you. They will provide advice and support through the application process and beyond. Being accepted onto the year in industry is subject to achieving a satisfactory performance. The year in industry is monitored and assessed by an academic member of staff and will appear on your final degree title. We also offer a non-specialist stream, which allows you to continue studying a variety of disciplines. You'll spend your final year studying your chosen stream. The interdisciplinary ethos of your degree will be continued in an advanced research, or industry-led, final-year project. Sheffield is one of the UK's top engineering universities. Gain a strong foundational knowledge of engineering disciplines from across our seven academic departments, before specialising in your area of interest in the final two years of your degree. The majority of our engineering courses can be combined with a year in industry; this is a great way for you to boost your career prospects. You'll gain a wide range of hands-on experience and get the chance to apply what you've learnt in your studies. The experience from a year in industry will be invaluable. It will improve your employability, you'll experience working in an industrial environment and you'll make crucial industry contacts. We'll support you in finding a year in industry or a summer placement. When you become part of Engineering at Sheffield, you'll be taught in the best integrated engineering teaching space in the UK. The Diamond has state-of-the-art teaching and lab facilities, using cutting-edge, industry-standard equipment. This course prepares you for a career where you'll apply your creative problem-solving skills and your understanding of engineering principles to the real world, while working in multidisciplinary teams. These transferable skills can be applied in many sectors across the breadth of engineering and beyond. Graduates from all of our courses are highly employable and work all over the world for companies such as Arup, Rolls-Royce, Boeing and IBM. I chose MEng Engineering for its exibility and the opportunity to study across disciplines for two years before deciding on a specialism. The staff are passionate and enthusiastic about the course and are always available to answer questions and offer support.